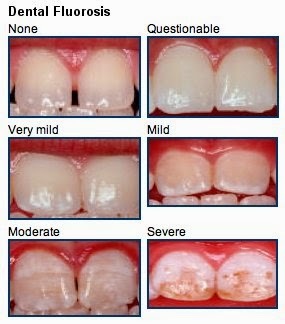 Fluoride, as a household word, has been connected with claims of enhanced oral health and hygiene for so long that many people are now unaware that fluorine, the gaseous element that fluorides come from, is one of the most unstable, reactive and toxic elements in the known universe. Fluorine is so volatile that under normal circumstances it cannot exist in its elemental state for more than a few seconds, before it has reacted and bonded with some other substance. horrendous damage to human health and the environment. In nature, it is usually found in rocks like fluorite. However, metallurgists had known for a long time that adding fluorite to metal ores was making it easier to extract iron during the smelting process. . Then in the 1600s, hydrofluoric acid was discovered. Ever since, it has been used for etching glass because of its extremely caustic properties. The industrial potential for fluorine seemed limitless. Still, its toxicity and volatility was an ever-present danger. 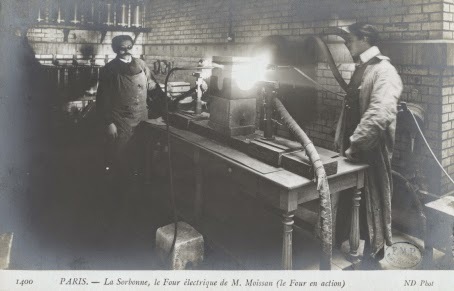 Early attempts to isolate fluorine in the laboratory usually ended in injury or death. The whole world has admired the great experimental skill with which you have studied that savage beast among the elements . Once fluorine could be produced on an industrial scale, it’s toxic legacy would become forever linked with another twentieth century industrial element, aluminum. Industrialists had been working for years to make mass aluminum production economically feasible. The Hall-Heroult process, also discovered in 1886 made this possible. Once bauxite is reduced into aluminum oxide, it is then smelted into aluminum by using cryolite. 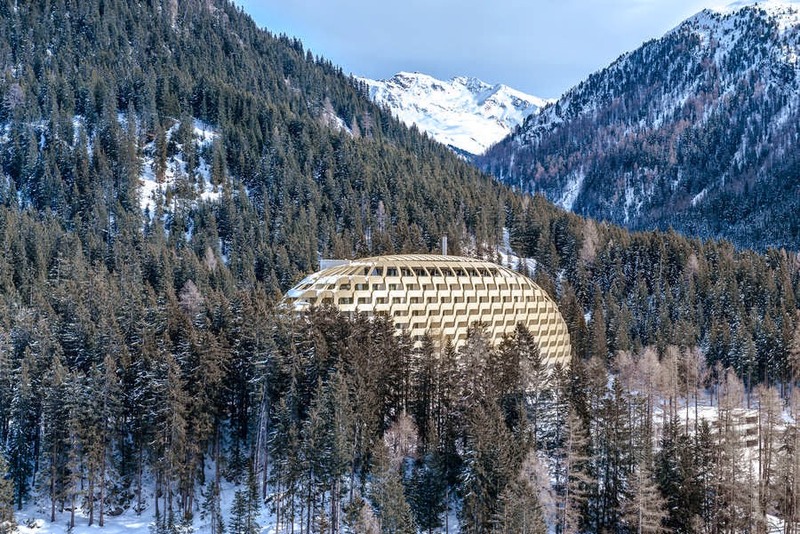 Cryolite is a mineral compound containing sodium and fluorine, which extracts the aluminum from melted ore through electrolysis. The extremely toxic waste left behind is sodium fluoride . This smelting process continues to be one of the principal sources of the fluoride added to municipal water supplies . However, most fluoride for involuntary fluoridation comes from the fertilizer industry. This is where the story gets more complex and frankly, sickening both morally and physically. Leftover highly toxic fluoride industrial waste from aluminum smelting had become a huge environmental and legal problem for ALCOA, the monopolist manufacturer of aluminum of the day. It’s was piling up in factories. It was leaking into the air. ALCOA was also brazenly dumping it into rivers where it was causing havoc and misery to both humans and animals. . Class action lawsuits were piling up for the aluminum, steel and fertilizer industries and the manufacturers needed a solution. Edward Bernays, the originator of the dubious profession of public relations, was hired by ALCOA to find a way around the troublesome catastrophe the industrialists had created for themselves . For most of the twentieth century, Bernays was the go-to-guy for corporations who wanted to change Americans’ thinking and behavior on issues that affected the bottom line. The video below shows several of the public relations campaigns that were put in place by Bernays. 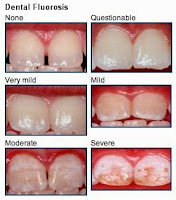 Americans with dental fluorosis, a disease brought on by fluoride intake, tells another story, Water fluoridation destroys teeth and provides steady income in the form of dentures, crowns, bridges and root canals.   . Now I’m not saying that dentists are evil, but the indoctrination process they go through leaves little room for dissent on the fluoride issue . If you can influence the leaders, either with or without their conscious cooperation, you automatically influence the group which they sway… Because man is by nature gregarious he feels himself to be member of a herd, even when he is alone in his room with the curtains drawn. His mind retains the patterns which have been stamped on it by the group influences. .
Now we tell them this, that at one part per million dental fluorosis brings about the most beautiful teeth that anyone ever had. And we show them pictures of such teeth. We don’t try to say there’s no such thing…but you have to have an answer. The crazy thing is not that Dr. Bull encourages the propagandists to invert the truth about fluoride poisoning, it’s the that the ADA originally recommended only 1 ppm of fluoride to provide 1 mg per day, from the tap water. That was in 1951. Today, with most people brushing with fluoride toothpaste, consuming processed food and drink with fluoridated water, most families cooking with tap water, hot baths and showers with fluoridated water, the amount of fluoride that the average American is exposed to on a daily basis is probably much higher than the original 1 mg per day target.  . With that in mind, the EPA maximum allowable amount for drinking water is 4 ppm. . That’s a level probably no one would have said was safe sixty years ago. With the experts fielding questions, the fluoridators knew that they had the groups they needed on board. Th government agencies like the PHS and CDC helped to spread the propaganda that Bernays and his team cooked up. Mass fluoridation solved problems for several groups. 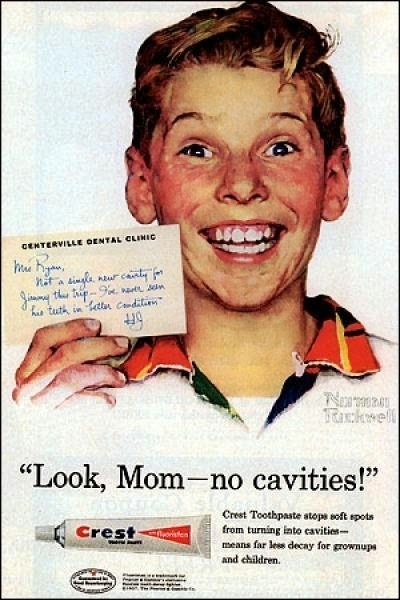 I’m afraid there’s no way around it, the medical and dental professions bring in a lot more money with fluoridation. Because of its damaging effects on the intellect, people are more compliant and less likely to question authority . And as mentioned before, there’s something we always have to keep in mind; the fluoride that finds its way into municipal water supplies and toothpaste is industrial waste, leftover from aluminum, fertilizer, nuclear and cement manufacturing  . Mass fluoridation gives some of these industries a way out of having to properly and legally dispose of the lethal buildup. While, admittedly there is no final proof of collusion between all of these groups, there is a mountain of circumstantial evidence. What cannot be denied any longer is that fluoride is wrecking our fragile ecosystems and human health. For those who want to look into the history, science and politics of fluoride, I’ve included links to websites and books that I used in researching this article. In my next piece, I’ll share what I’ve found out about how we can rid our bodies of fluoride calcification, find sources of better nutrition and hydration and protect our health and longevity through reclaiming our own biochemistry. Connett, Michael. “Hypersensitive Reactions to Topical Fluorides.” Fluoride Action Network. American Health Studies Project, 1 Mar. 2012. Web. 28 May 2015. “Edward Bernays.” Wikipedia. Web. 15 May 2015. “Fluorine.” Wikipedia. Web. 15 May 2015. Spittle, Bruce. “Dyspepsia Associated with Fluoridated Water.” Fluoride Research. International Society for Fluoride Research, 1 Feb. 2008. Web. 17 May 2015. .
Null, Gary. “Fluoride: Killing Us Softly.” Global Research. Center for Research on Globalization, 6 Mar. 2014. Web. 27 May 2015. <http://www.globalresearch.ca/fluoride-killing-us- softly/5360397>. Toon, Richard. “Fluorine, an Obsession with Tragic Past.” Education in Chemistry (2011): 148-51. Rsc.org. Royal Society of Chemistry. Web. 25 May 2015. Waldbott, G.L., A.W. Burgstahler, and H.L. McKinney. “Industry and Fluoride.” Fluoridation: The Great Dilemma. Lawrence: Coronado, 1978. 295-305. Print. 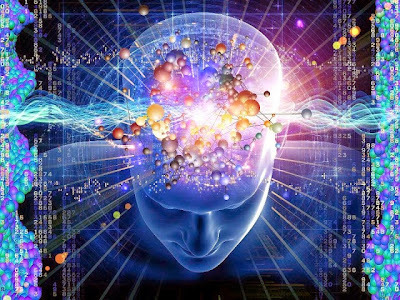 If you search the terms “pineal gland,” “fluoride calcification,” or “opening the third eye” you will see that there is a quiet, yet deeply profound transformation taking place in our culture. People of all ages, from all walks of life are getting serious about enlightenment and spiritual fulfillment. Much of this discussion centers around the mysterious bean-like growth located just beneath our brains, the pineal gland. For many years medical science regarded the pineal gland as a vestigial organ from our animal past. All of that began to change in 1958, when Yale scientists discovered that the pineal gland secretes melatonin, a hormone that is absolutely essential for healthy sleep and physical development. The other major hormones produced by the pineal gland are serotonin “the feel-good hormone” and DMT. Discovered in 1931, DMT is the natural occurring “spiritual” or “visionary” hormone that so many are interested in today. Although, DMT is a natural compound produced within the tissues of most plants, and in animals that have pineal glands, it remains illegal to possess in most countries. The light of the body is the eye: if therefore thine eye be single, thy body shall be full of light. But if thine eye be evil, thy whole body shall be full of darkness. If therefore the light that in thee be darkness, how great is that darkness! . lutions is the third ventricle, a vaulted hamber of initiation. coffer in the Great Pyramid ” . That;s a heavy statement from Hall, a man who influenced presidents like FDR and Reagan. 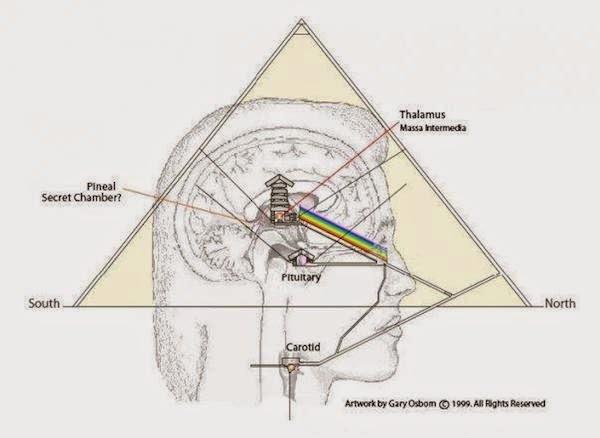 In fact, it would seem that the visual symbol of the “All-Seeing Eye” atop the pyramid on the reverse of the Great Seal of the United States is a hidden reference to the pineal gland’s power of spiritual transformation. The story of how Manly P. Hall’s Philosophical Research Society supported the Russian mystic Nicholas Roerich’s expedition to Tibet in search of the hidden city of Shambhala with USDA scientists during the era of New Deal, will have to wait for another post. Suffice it say, when when Manly P. Hall spoke, those in high places took heed.  . 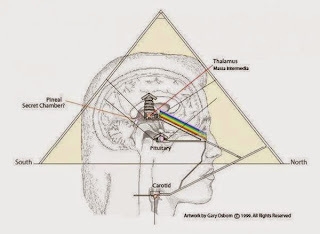 When the image of the Great Pyramid is superimposed upon an anatomical cutaway of the human head, the significance of the pineal gland to ancient Egypt’s concept of the Divine becomes immediately apparent. of life, and lunar crescents. 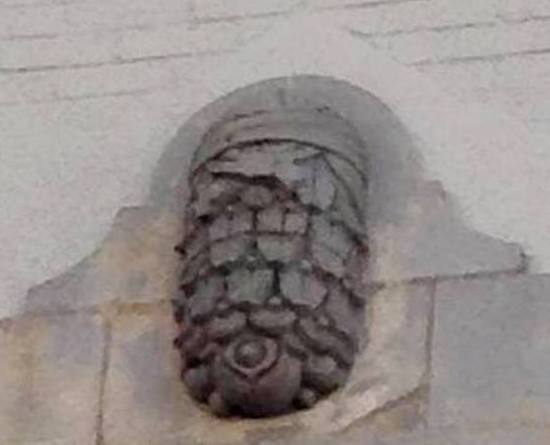 Yet, the most prevalent symbol of the pineal gland is the pine cone, which is where it gets its name, for it shape and rough surface. 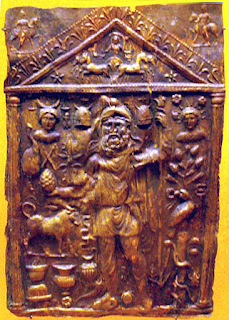 When the pine cone is found in ancient art, it most often represents a connection between man and Deity. This tradition carries on in the civic and religious iconography of the modern world. However, the intense focus on this tiny organ in ancient art begs the question, “How were the ancients able to access its power?” Fortunately, some of the ancient techniques for awakening the pineal gland and opening the third eye are available to us in the modern world through yoga and meditation. The most well-known mantra for meditation is “AUM,” which when repeat by the practitioner seems to vibrate the area around the pineal gland and thereby stimulating it into secreting whatever hormones are needed by the body to attune itself to higher realms of consciousness . It is unfortunate that the laity of most religions are not encouraged to develop the latent spiritual faculties within us all. Most religions leave out that part when it comes to the average believer. Instead the priesthood instructs the people mostly about matters of dogma, ethics and faith, which when guided by reason and justice are good things. However, the iconography of the Roman Catholic Church shows that the some in the hierarchy are aware of the pineal gland’s potential for spiritual development. The history and symbolism is there for all to see. The Court of the Pigna, Vatican City, Rome. 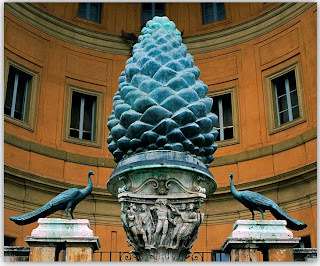 The giant pine cone sculpture at the Vatican’s Court of the Pigna is an ancient bronze casting that was originally displayed between the Pantheon and the Temple of Isis in imperial Rome . 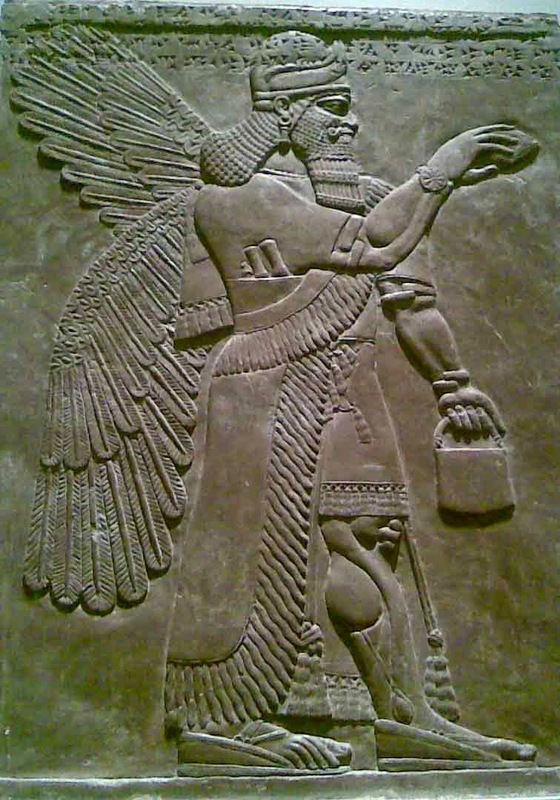 In the mysteries of Isis it is said that pine cones were burned in remembrance of Osiris. . The priests of Isis would actually flay themselves with pine cones as part of a self mutilation rite! . Yes, the belief that suffering was the unavoidable price of wisdom was something that the ancient peoples took seriously. The peacocks flanking the pine cone are also part of the symbolic whole. With its tail of many eyes the peacock represents watchfulness. The orthodox symbolism is the vigilance of the Catholic Church. Yet even before that, the peacock came to symbolize spiritual vision, and eternal life, since it’s identified with the Phoenix of classical mythology. . 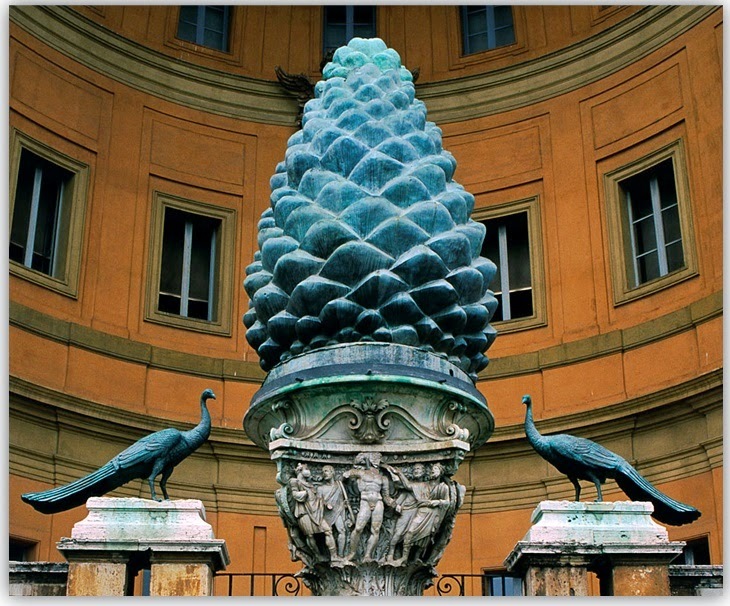 Still, there’s something more than that being implied here with the gigantic niche enveloping the pine cone focal point. 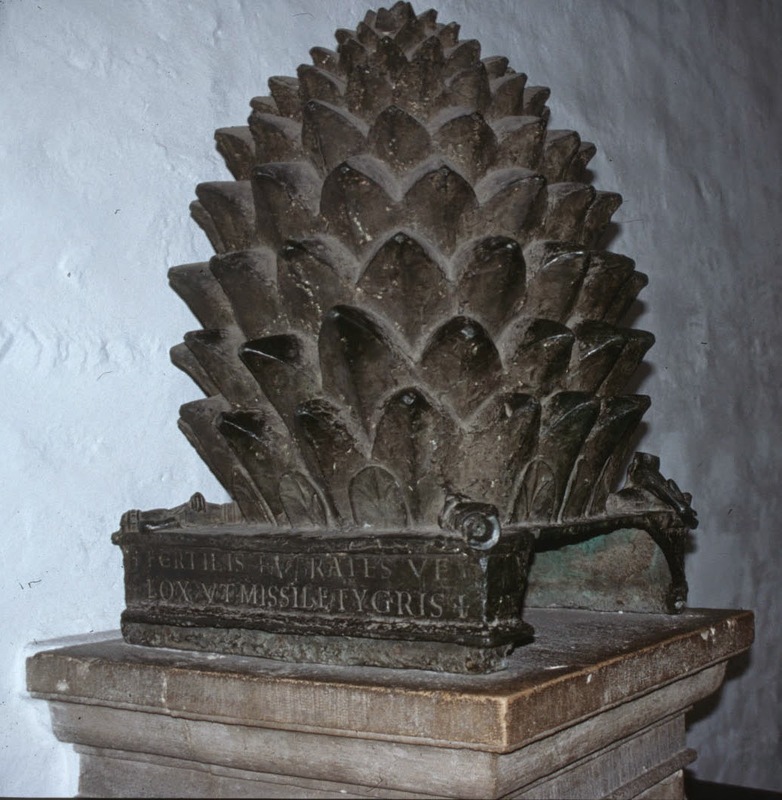 The pine cone sits between the many eyes of the peacocks in the dome of the niche. The meaning cannot be denied, the Court of the Pine Cone is a symbol of the human skull from a spiritual perspective. For those with eyes to see, the pineal gland within our own skulls may hold the key to many of our questions and longing for meaning and fulfillment in our hectic modern world. It’s my opinion that the ancients were right. The pineal gland is proof of an invitation from Nature herself to explore the worlds we carry within us. It is the mark of our spiritual birthright. Science has been slow to acknowledge it’s importance, but that attitude is now changed forever. In my next post, I’ll take up the 21st century challenges we face in unlocking the potential of the pineal gland, which unfortunately include the dangers of fluoride to all facets of human health, physical, mental and spiritual. ,  Hall, Manly P. The Occult Anatomy of Man. The Philosophical Research Society. Los Angeles 1937. p 11. Cox, Simon. Decoding The Lost Symbol: The Unauthorized Expert Guide to the Facts Behind the Fiction. Simon and Schuster. 2009. p 96. The Free Encyclopedia, 6 Nov. 2013. Web. 10 May. 2015. Regula, DeTraci. 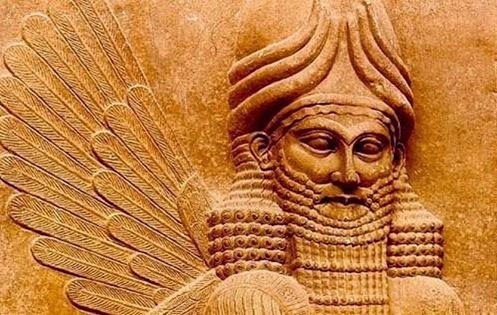 The Mysteries of Isis: Her Worship and Magick. Llewellyn Worldwide, 1995. p 165. Newman, John Henry. An Essay on the Development of Christian Doctrine. Pickering 1878. p 215.